Batman Birthday Party Ideas For Your Caped Crusaders! For The Batman-Lovin' Cape Crusader In Your Life! Gather your Cape Crusaders and get ready to spring into action with a fun Batman party. To help you host a Bat-tastic party that will knock out all your super heroes, here are a few Batman party ideas that will give you an action-packed party full of super-duper fun! The following ideas will help turn your humble abode into the next best thing to the infamous bat cave. BATMAN COMIC INVITATIONS - Start by removing several pages from various Batman comic books. Then Whiteout the words that appear in the comics' speech bubbles. Then make some color copies of all these pages. Lastly, write in the party details in the speech bubbles and mail them out to your guests. BATMAN CAPE INVITATIONS – Make your own Robin or Batman shaped cape template, then trace the template on yellow and black cardstock, cutting out enough capes to have one for each guests. In the very center of each cape, write the first or last initial of your child in bold, large print. Write “Calling Cap Crusaders!” on the front of the invitation. Be sure to add party information to the back and then send out the invitations to Batman fans--guests. BAT SYMBOL INVIATIONS – Use black cardstock and cut out the bat symbol. Take a silver gel pen and use it to write party information on the back. Add to a cool envelope and send it off to guests. BATMAN BIRTHDAY PARTY PHOTOGRAPH INVITES – Take a piece of black cardstock (8 ½” x 11”), cutting it in half and then folding each piece in half again to make each of the invitations. Use a photograph of your youngster wearing a Batman costume and trim up the photo so it fits onto the invitations. If you want a little more visual appeal and to make the edges look nice, you might consider cutting the edges with some decorative scissors. Attach the photo with glue to the invitation’s front. Right over the photo, write, “Help Me Save Gotham!” Write out all of the party details on the inside. the Joker stole his Batman cake! and help him defeat the Joker! Finish off your invites by using Batman stickers to decorate the invitation. EMBELLISH BATMAN BIRTHDAY PARTY INVITATIONS - Buy some ready-made Batman invitations and embellish with glitter. You will of course want to invite your friends to come dressed in their favorite Batman character costume. Also, don't forget to remind them to and to bring their super powers to the party. As an alternative, as your guests arrive, turn them into Batman. In fact, you can make the transformation an activity for the kids to do at the party, or just go ahead and provide the various items upon arrival. Start with a black cape and add a black Batman emblem that is affixed to a yellow piece of fabric. Also hand out black Batman Masks. If you would like to check out some KIDS BATMAN COSTUME photos to help give you some additional costume-making ideas, click on the above link and check 'em out! Use yellow and black balloons and streamers to decorate the party ceilings. Let little Cape Crusaders pass through doorways decorated with yellow and black streamers. Tie back black sheets using yellow sashes, using them to decorate wide walkways. Use black or yellow tablecloths on the tables, topping with fun toppers in the opposite color. Use yellow and black ribbons to tie off corners, scattering fun Batman confetti on the tabletops. Have fun using napkins, cups, centerpieces, plates and other party paper goods in yellow, black or the Batman theme. Make some placemates for your table out of black posterboard or construction paper; make them into the shapes of bats. You can laminate them for added durability and hand them out as party favors. Put batman balloons on birthday child's chair and black and yellow helium balloons on other chairs. Using some fun Batman toys, create a beautiful centerpiece. Use tissue paper in yellow and black, as well as some helium balloons to finish the centerpiece. Hang black and yellow streamers throughout the party room. Cover the walls with black fabric. To give your party room walls a lift, hang Batman wall decals. You can always repurpose them by placing them onto your kid's bedroom walls. Hang a Batman birthday banner over your cake table or liven up a barren wall with the fun banner focal point. Another option for giving those blank walls a Bat-lift is to hang some Batman posters throughout the party room. Hang bats from the ceiling and off of the walls. Also add some cobwebs throughout using angel hair or use spider webs. For a unique wall decor or tablecloth, start out by having your local office supply store enlarge your Batman comic strips to a poster size or bigger. Using some fishing line, hang up fun bat emblems (purchase them or make them yourself) from the ceiling. Hang clusters of black, yellow, and blue latex balloons throughout your party room and attach coordinating curling ribbons. Using butcher paper in black, cover up the front door, using yellow letters to write the phrase, “Welcome to Gotham!” To let guests know where the party is at, hang yellow and black balloons outdoors from the mailbox, a tree or your car. Using chalk, draw big question marks in yellow along the sidewalk. Here are some Batman birthday party cuisine ideas that will fill your little characters up. Just remember to add fun signs identifying your Bat foods. BATS IN A BLANKET – Use a knife to cut hotdogs lengthwise, while avoiding cutting all the way through. Tuck in a cheese strip, then wrap the hotdog in a triangle of crescent roll dough. Bake your bats to be in accordance with the roll's directions. BATMAN BIRTHDAY PARTY SANDWICHES – Make fun sandwiches for the kids, using a batman cookie cutter to cut out the sandwiches. PENGUIN POPPERS – Chicken poppers or tasty pizza rolls. BAT WINGS - Chicken wings. BAT-A-RONI & CHEESE – Mac and cheese is a favorite with kids, so make a delicious recipe and let the kids enjoy. POISON IVY SALAD - Macaroni, potato or pasta salad. PENGUIN DIP & CHIPS – Use a plastic top hat in black, filling it up with some chips. For an accent, add a cigar and white gloves by the chip dip. CATWOMAN CLAWS - What kid doesn't enjoy placing Bugles on their fingers--none that I know of and they instantly make them look like they have claws. BAT PELLETS – Tasty raisins covered in dark chocolate. ROBIN'S EGGS - Speckled chocolate eggs or deviled eggs. POISON IVY PUNCH – On the day before your Batman party, place a strand of fake ivy in an ice ring, creating an ice ring to use in your punch. Make up a green punch mix, then pour into the punch bowl. Add a two liter bottle of ginger ale, then add the premade ice ring with ivy to the punch when you’re ready to serve. POWER DRINKS – Serve up glasses of Gatorade, adding pop rocks to the drinks when serving. The pop rocks makes the drinks, crackle and pop. BATMAN BIRTHDAY PARTY SHEET CAKE – Frost a large sheet cake with white icing. Then, use an airbrush to give the cake top a pale gray color. Use yellow sprinkles to decorate the sides, topping the cake with fun plastic Batman villains and action figures. BATMAN PHOTO CAKE – Have your child dress up in a fun Batman costume and take a photo. Take the photo to one of your local artistic bakeries and have them put it onto the cake and decorate accordingly. BATMAN BIRTHDAY PARTY CAKE #1 – Frost a premade sheet cake (buy it or bake it yourself) with some white icing. Airbrush the cake in a light gray color, then top with a Batman edible sugar image. BATMAN-SHAPED CAKES – Find a Batman shaped cake pan and bake up your child's favorite cake. Then try your hand at decorating it up as the directions included with the pan suggest, or perhaps you have a friend who might be willing to take on this little project. Top off the cake with Batman or and/or Gotham City candles. BATMAN CUPCAKES – For fun, pretty Batman themed cupcakes, bake up some delicious cupcakes. Use gray frosting to ice the cupcakes. Add cupcake picks with a Batman theme. BAT EMBLEM CUPCAKES – Frost premade cupcakes in pale gray frosting. Using black frosting, pipe on the Batman emblem. If you're interested in creating your own favor assortment, you can buy premade favor bags with a Batman theme or create your own assortment, using clear cellophane bags, batman stickers and some yellow ribbon to tie them off. Fill it up with things like: Batman figurine, a Batman book, crayons and a Batman coloring activity type of book, Batman spinning top, puzzle, blowout, stickers, foam Batman Bat-A-Rang, punch balloon, Galaxy slime, or glow sticks. 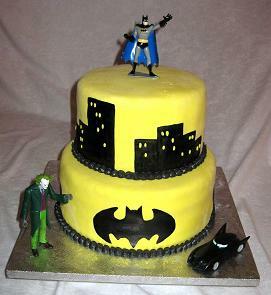 Do you have some favorite Batman birthday party ideas, cakes and costumes? Do tell! Please share all your party tips and ideas for invitations, decorations, games, etc., along with your batman cake and costume ideas.